Piłka nożna. Fútbol. Football. My eye on the beautiful game. On Monday, new Polish head coach Jerzy Brzeczek will make his first national team selections since being named the replacement for Adam Nawalka following a disappointing world cup. Brzeczek has promised, the team needs some changes but has ruled out a total re-build. The big test for Brzeczek will be who he will select, and more importantly, who he won't select. In interviews after being named the head coach, he has made it know he feels it's important the players who play for the national team are getting playing time at the club level. Several key players from Nawalka's era such as Kamil Grosicki and Brzeczek's nephew Jakub Blaszczykowski have not played since returning from the world cup. They're not the only ones. Central defender Jan Bednarek hasn't dressed yet in three matches for Southampton and Euro 2016 hero Michal Pazdan hasn't played much for Legia Warsaw, and his coach saying the reason is because Pazdan isn't yet fit from the world cup. Brzeczek may have the perfect excuse for calling some of these players despite what he has said after being appointed as coach. All he has to say is the seasons are just starting and everyone has a free slate. Whatever he decides, the truth of the matter is that while Poland doesn't need a total rebuild, but they do need changes. He also won't have Lukasz Piszczek at his disposition as the Borussia Dortmund star announced his retirement from national team football shortly after returning from the world cup. Poland has strength at several positions, but in others, there is a sort of a epidemic. Who will play on the wings? Who will play next to Kamil Glik at central defense? And who will play at left back? At left back, the obvious option is Arkasiusz Reca, who has a very similar story to Piszczek. A forward turned midfielder turned left back - by Brzeczek of all people during their time with Wisla Plock. Reca this summer moved from the Polish ekstraklasa to Seria A Atalanta but he has yet to play for the club this season. Other options could include Maciej Rybus, who was used in that role by Nawalka but wasn't too successful. He could turn back to Artur Jedrzejczyk, who at 30 years old, is only a band-aid fix, but could give the new coach just enough time before someone else steps up for the role. Pawel Jaroszynski gets regular time in the Seria A with Verona, but at 24 years old still seems to have a lot to work on. He might not be ready for the role. Lastly, he could use Bartosz Bereszynski on the left and find someone else to play right back - namely Tomasz Kedziora or Alan Czerwinski. Kedziora has been a mainstay with Dynamo Kiev while Czerwinski has been a stud in the ekstraklasa with Zaglebie Lubin. So far this season, Czerwinski has been one of the leagues best defenders though six weeks. On the wings, I think Brzeczek will try to make it as little messy as possible. 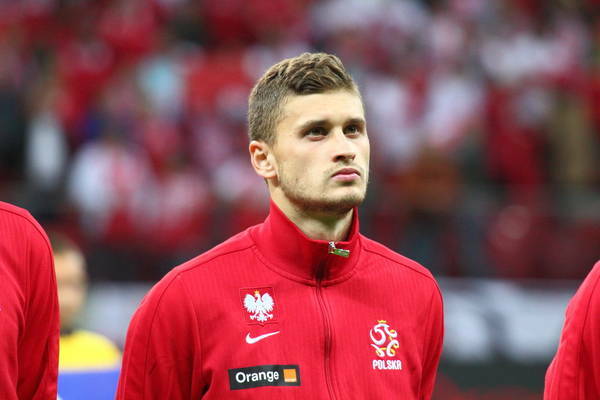 Therefore i think he will call-up Grosicki and Kuba to the team, but Leeds United star Mateusz Klich i think makes his return to the national team after four years. I also think Klich will be starting when Poland kicks off against Italy in two weeks. Przemyslaw Frankowski, who just missed out on a spot on the world cup team, i think will return. He's looked very strong this season for Jagiellonia, and is linked with several clubs this summer. With the transfer window nearing a close, a move to Turkey is still very realistic for the 23 year old winger. Damian Kadzior and Rafal Kurzawa, two Gornik stars from a year ago, i also think will be named to the national team. Both are just starting up with new teams and Kurzawa has yet to start but has appeared for Amiens in Ligue 1 as a sub. One position the team is heavy on is striker, and Brzeczek will be able to use one of his strikers in a winger role, possibly Sampdoria's Dawid Kownacki. If the coach decides to call-up Grosicki and Kuba in midfield, he would have no other option but to callup Bednarek. And if he calls him up, it would only make sense to start him with Glik right away. Bednarek-Glik duo will give Poland the best chance to win, atleast until Pazdan is ready and back in his euro 2016 form, and that is if he ever gets back to that form again.